DELAFIELD, Wis. (Stockpickr) -- No matter what the market is doing on a day-to-day basis, there's always some pocket of strength developing in individual stocks. Once you know what setups to look for from a technical standpoint, then you can develop a list of stocks that have the potential to get explosive and skyrocket higher. Again, it doesn't matter what the market is doing, these setups show up on a daily basis. One of my recent ideas that soared to the upside very quickly was health care player TearLabs (TEAR, which I featured in Feb. 12's "5 Stocks Under $10 Set to Soar" at $6.50 share. That chart was showing an extremely oversold condition and shares of TEAR were starting to reverse its recent downtrend and move within range of triggering a near-term breakout trade. That breakout triggered, and shares of TEAR exploded to the upside and hit an intraday high on Tuesday of 8.14 a share. That's a fat gain in a very short timeframe for anyone who bought the breakout and played that high-probability setup. Shares of TEAR still have the potential to go much higher from current levels. Traders should now watch for this stock to take out its 50-day moving average of $8.29 a share soon with high volume. That's what will be needed to spark the next leg higher for TEAR. Some of my favorite places to look for these explosive setups are in sectors such as biotech, pharmaceuticals, advanced technology and any stock that trades under-$10 that has a technically bullish chart. These are the places that I find the next stock that's setting up to skyrocket higher and make me some quick cash. With that in mind, here's a look at five stocks that could be setting up to make explosive moves to the upside soon. One specialty pharmaceutical player that could be setting up to skyrocket higher is Catalyst Pharmaceutical Partners (CPRX, which focuses on the development and commercialization of novel prescription drugs targeting rare neuromuscular and neurological diseases and disorders. This stock has been in play with the bulls over the last three months, with shares up around 16%. If you consult the chart for Catalyst Pharmaceutical Partners, you'll notice that this stock has been trading sideways inside of a range for the last two months and change, with shares moving between $1.73 on the downside and $2.29 on the upside. Shares of CPRX are just starting to flirt with its 50-day moving average of $1.97 today, and that move is quickly pushing shares of CPRX within range of triggering a big breakout trade. 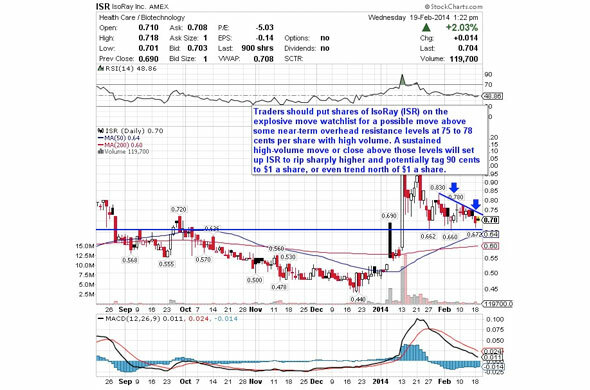 That breakout would send shares of CPRX above its recent range, which could lead to a powerful move higher. Traders should now look for long-biased trades in CPRX if it manages to break out above some near-term overhead resistance levels $2.04 to $2.20 a share and then above $2.29 a share with high volume. Look for a sustained move or close above those levels with volume that registers near or above its three-month average volume of 886,151 shares. If that breakout triggers soon, then CPRX will set up for a monster move higher that could see the stock re-fill some of its previous gap-down-day zone from October that started near $2.80 a share. 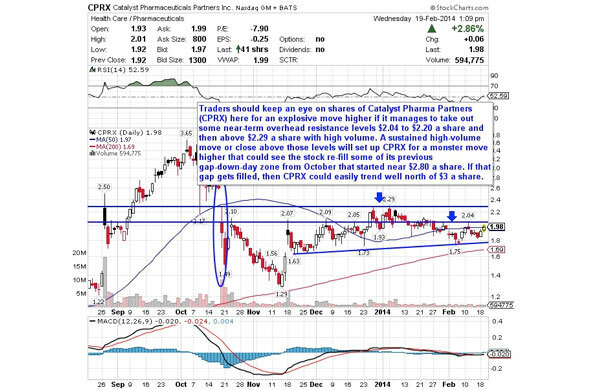 If that gap gets filled, then CPRX could easily trend well north of $3 a share. Traders can look to buy CPRX off any weakness to anticipate that breakout and simply use a stop that sits right around some key near-term support levels at $1.75 to $1.73 a share. One can also buy CPRX off strength once it clears those breakout levels with volume and then simply use a stop that sits a comfortable percentage from your entry point. One consumer goods player that could be setting up for an explosive move higher soon is Crystal Rock (CRVP, which engages in producing, marketing and distributing bottled water; and distributing coffee, ancillary and office products, and other refreshment products in New England, New York and New Jersey. This stock is off to a monster start for the bulls in 2014, with shares up sharply by 28%. If you take a glance at the chart for Crystal Rock, you'll see that this stock has been uptrending strong over the last month and change, with shares moving higher from its low of 82 cents per share to its recent high of $1.33 a share. This stock recently pulled back right to its 50-day moving average of $1.01 a share and then subsequently found buying interest that has now pushed the stock back above $1.20 a share. 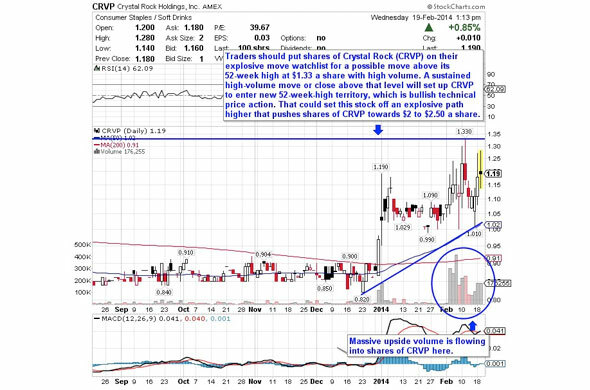 That move is quickly pushing shares of CRVP within range of triggering a major breakout trade. Traders should now look for long-biased trades in CRVP if it manages to break out above its 52-week high at $1.33 a share with high volume. Look for a sustained move or close above that level with volume that hits near or above its three-month average volume of 46,364 shares. If that breakout materializes soon, then CRVP will set up to enter new 52-week-high territory, which is bullish technical price action. That could set this stock off an explosive path higher that pushes shares of CRVP towards $2 to $2.50 a share. Traders can look to buy CRVP off any weakness to anticipate that breakout and simply use a stop that sits right below $1 a share. One can also buy CRVP off strength once it blows past $1.33 a share with volume and then simply use a stop that sits a comfortable percentage from your entry point. Another biopharmaceuticals player that could be setting up here to skyrocket higher is ThermoGenesis (KOOL, which designs, develops and commercializes devices and disposable tools for the processing, storage, and administration of cell therapies. This stock has been roaring to the upside so far in 2014, with shares up a whopping 120%. If you take a look at the chart for ThermoGenesis, you'll quickly see that this stock has been trending sideways and consolidating over the last month, with shares moving between $2.01 on the downside and $2.65 on the upside. This range bound trading pattern is coming after shares of KOOL recently exploded higher from $1.04 to $3.24 a share with heavy upside volume. Shares of KOOL could now be setting up again to make a monster move higher if this stock can take out some key near-term overhead resistance levels with volume. Traders should now look for long-biased trades in KOOL if it manages to break out above some near-term overhead resistance levels at $2.40 to $2.58 a share and then once it clears $2.65 a share with high volume. Look for a sustained move or close above those levels with volume that hits near or above its three-month average action of 1.42 million shares. If that breakout gets underway soon, then KOOL will set up to explode higher and possibly re-test or take out its 52-week high at $3.24 a share. 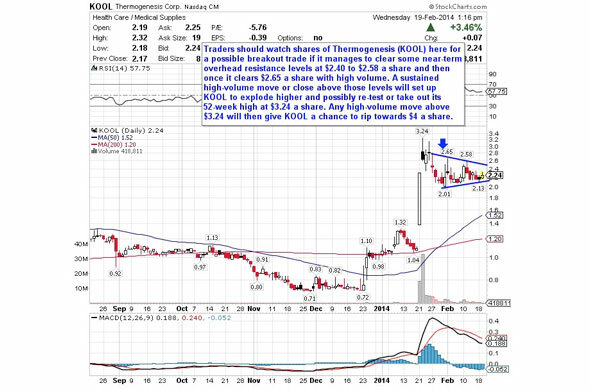 Any high-volume move above $3.24 will then give KOOL a chance to rip towards $4 a share. Traders can look to buy KOOL off any weakness to anticipate that breakout and simply use a stop that sits right below some key near-term support levels at $2.13 to $2.01 a share. One could also buy KOOL off strength once it starts to take out those breakout levels with volume and then simply use a stop that sits a comfortable percentage from your entry point. Another biotechnology player that could be setting up for a monster move higher is Ocera Therapeutics (OCRX, which focuses on the development and commercialization of therapeutics for patients with acute and chronic liver disease. This stock has been on fire over the last six months, with shares up huge by 115%. If you take a look at the chart for Ocera Therapeutics, you'll see that this stock recently sold off sharply from its high of $19.94 to its low of $12.01 a share. Following that selloff, shares of OCRX have started to snapback and push above its 50-day moving average of $13.74 a share. This stock has also formed a major bottoming pattern at around $12 to $13 a share over the last month. Shares of OCRX are now starting to trend within range of triggering a major breakout trade above some key near-term overhead resistance. Traders should now look for long-biased trades in OCRX if it manages to break out above some near-term overhead resistance at $15.05 a share with high volume. Look for a sustained move or close above that level with volume that hits near or above its three-month average action of 67,487 shares. 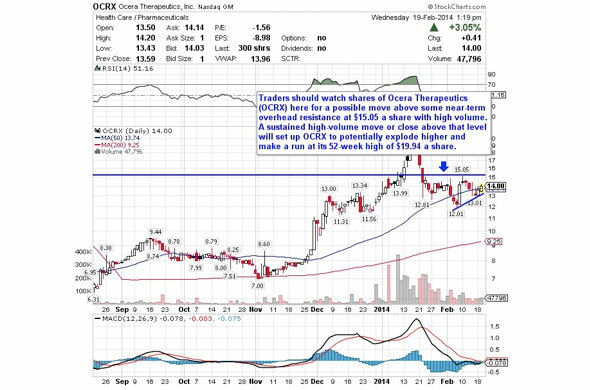 If that breakout gets sparked soon, then OCRX could explode higher and make a run at its 52-week high of $19.94 a share. Traders can look to buy OCRX off any weakness to anticipate that breakout and simply use a stop that sits right below some key near-term support levels at $13.01 to $12.01 a share. One can also buy OCRX off strength once it starts to take out those breakout levels with volume and then simply use a stop that sits a comfortable percentage from your entry point. My final idea that could be preparing for an explosive move higher here is IsoRay (ISR - Get Report), which develops, manufactures, and sells isotope-based medical products and devices for the treatment of cancer and other malignant diseases primarily in the U.S. This stock has been trading strongly to the upside over the last three months, with shares up big by 41%. If you look at the chart for IsoRay, you'll notice that this stock recently formed a major bottoming chart pattern, after shares of ISR found buying interest over the last month each time it traded down towards 66 to 67 cents per share. So far, those levels have held and now shares of ISR are starting to push within range of triggering a major breakout trade above a key downtrend line. Traders should now look for long-biased trades in ISR if it manages to break out above some near-term overhead resistance levels at 75 to 78 cents per share with high volume. Look for a sustained move or close above those levels with volume that hits near or above its three-month average action of 940,443 shares. If that breakout hits soon, then ISR will set up to rip sharply higher and potentially tag 90 cents to $1 a share, or even trend north of $1 a share. Traders can look to buy ISR off any weakness to anticipate that breakout and simply use a stop that sits right below those major support levels at 67 to 66 cents per share. One can also buy ISR off strength once it starts to clear those breakout levels with volume and then simply use a stop that sits a comfortable percentage from your entry point. To see more stocks that could be setting up to skyrocket higher soon, check out the Skyrocket Stock Watchlist portfolio on Stockpickr.